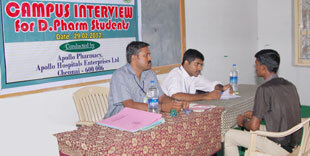 The B.Pharm course is of four years duration (Non-Semester), for which the Tamil Nadu Dr. M.G.R. Medical University, Chennai, conducts the qualifying examinations. Students completing this degree course are eligible to register as pharmacist and practise the profession throughout India as per the rules and regulations of Pharmacy Council of India. Through this degree program the students are trained to work in hospitals as well as in pharmaceutical manufacturing and analytical units. Apart from the usual curriculum, the college provides practical training in pharmaceutical industries and in hospitals all over India. Students completing the degree program in this institution are thus themselves getting enormous confidence and ability in their profession. The D.Pharm course is a two years course for which the Directorate of Medical Education, Chennai, conducts the qualifying examinations. In this course, the students are well equipped and trained to prepare and dispense the pharmaceutical substances. They also receive in-plant training in government hospitals at the headquarters through which the communication skill with the patients and the confidence towards the profession are improved significantly. * GATE * TOEFL * Spoken English * Computer Programming etc. It is optional for the student to select one or more of these. All such training/ coaching are being conducted with the assistance of experts specialized in the corresponding areas. Pharm Products Pvt. Ltd. conducted campus interview on 12/04/2006 and 13/04/2006 for the post of Product Executive and Medical Representatives, candidates selected for final interview.